Born, raised and educated in Canada, Stephen spent the first half of his career working for the two largest oil companies in the world: Exxon and royal Dutch Shell. He spent the second half working for one of the smallest oil companies in the world; his own. He has three sons and one daughter, all of whom are grown and “off the payroll”. 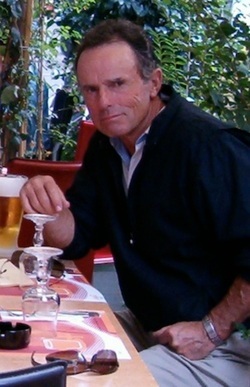 Now retired, he spends his summers with his wife, Ann, and their two cats, Abby and Samantha, at their Canadian home near Niagara Falls. They winter at their Florida home in Port St. Lucie. When he is not writing, he is reading, traveling, or playing horrifying golf. He plans to write until the day he dies, probably longer. For Stephen, writing was an accident. When his friends in Muskoka, Canada, and Florida became aware of the story of his incredible life in the Canadian oil business, they encouraged him to commit it to writing. They insisted it was a story that must be told, that it is a piece of national history. Reluctantly, he did, and after more than twenty years the story of AN ENDLESS AND CONFLICTED LOVE, A MAN WHO PLAYED WITH FIRE AND NEARLY LOST HIS LIFE DOING IT, and ONE OF THE LARGEST AND MOST AUDACIOUS THEFTS IN CANADIAN HISTORY, was finally made public. Stephen has entitled the book: The Bridge to Caracas, for reasons that will ultimately be obvious to readers. Prior to choosing that title, he considered entitling the book: The Nicest Crook I Ever Knew, but in the end, Jim Servito, the antagonist, was really not very nice. 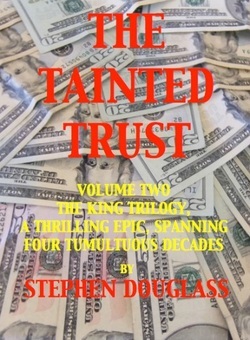 The sequels,The Tainted Trust, (the story of what happened to the $325,000,000 stolen from the Canadian and U.S. governments), the second in The King Trilogy, and Kerri’s War, the third volume in The King Trilogy, (the continuing saga of the inconvenient fortune, are now live on Amazon KDP. 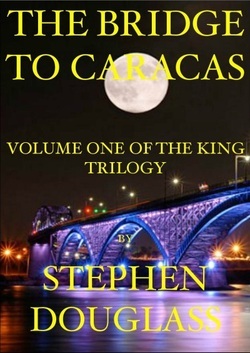 THE BRIDGE TO CARACAS is Volume one of THE KING TRILOGY, an epic story, spanning four tumultuous decades, of an inconvenient fortune and its catastrophic affect on a loving family. Jim Servito shatters the hopes and aspirations of star-crossed lovers, Mike King and Karen Taylor, while simultaneously engineering a grand theft ranking as one of the largest and most audacious in Canadian and U.S. history. Cynical and remorselessly ruthless, he possesses a brilliant criminal mind, has enormous contempt for the law, police, governments, and the system in which they function. He assumes rules are for fools, and takes sadistic pleasure in breaking them. Using The Peace Bridge as his fulcrum, he steals $325,000,000 from the U.S. and Canadian governments, steals enormous quantities of gasoline by illegally installing valves in Golden National’s Buffalo refinery, then murders everyone who can implicate him. The setting is storybook perfect. The beautiful daughter of wealthy parents meets the handsome son of middle class parents. The two fall in love and assume they will marry and live happily ever after. History would prove their assumption wrong. Cruel twists of fate and the wrath of Jim Servito combine to prescribe a horrible nightmare for the two lovers, one that grows in intensity and ultimately leads them to prison, then a life and death confrontation with Servito in Caracas. No one wept when Jim Servito died. He left an estate amounting to $325,000,000 when his wife, Karen killed him in Caracas. He had accumulated the fortune the old fashioned way: he stole it from the U.S. and Canadian Governments using a brilliant gasoline tax evasion scam. The money is hot, deposited in a Cayman Island bank, and its cursed. It has a profound affect on everyone who touched it. It is managed by Alfred Schnieder, an aging and unscrupulous Caracas banker. Kerri Pyper, Mike King’s twenty-three year old estranged daughter, has not seen or communicated with her father since she was nine. She discovers the existence of The King Trust and is shocked to learn that her natural father is its Trustee. Visconti, desperate and assuming he is still the smartest man in the room, embezzles the fortune and flees to Monaco. He made only two mistakes: he deceived both Mike King and Alfred Schnieder and fell in love with Kerri. Kerri King’s dedication and tireless work ethic had taken her to the top. She was the president and CEO of Iacardi & Sons, one of the largest and most successful commodity trading companies in the world. Everything was perfect, until the company was nearly decimated by the terrorist attacks on September 11, 2001. Tormented by the loss of all but three of the company’s New York employees, and driven to provide a source of income for the families and loved ones of the Iacardi employees who died on that terrible day, she begins the fight to rebuild the company. Virtually all of the cards and circumstances are stacked against her. The company is broke. Charles and Mario Iacardi, the company’s founders and financial providers, are dead. Peter Tavaris, Walter Deaks, and Billie Dukes, the three surviving New York employees, are vehemently opposed to Kerri’s continuing leadership. Enerco, a gigantic Houston based energy trading company, conspires to purchase Iacardi & Sons, and employs every dirty trick in the corporate playbook to accomplish that objective. Desperate to salvage value for their Iacardi stock, the shareholders launch a billion dollar lawsuit against Kerri, and vote to have her removed as president. In her quest to provide financial relief to the estates of deceased Iacardi employees, Kerri choses to give away to the Iacardi estates every cent of the fortune accruing from her father’s tainted trust. Her decision triggers disastrous consequences doled out by the Internal Revenue Service.